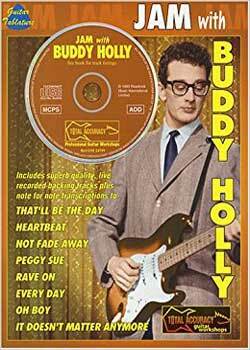 Jam With Buddy Holly PDF + Mp3 CD download. Buddy Holly was one of the first major rock’n’roll groundbreakers. He wrote his own songs, recorded with a self-contained guitar-bass-drums combo and even changed the image of what a rock singer could look lie. His vocal style and mature, melodic compositions inspired many of the rockers who would emerge in the 60s and 70s, from the Beatles and Bob Dylan to the Hollies. The combination of musical notation and guitar tablature in this book together with the backing tracks on the CD gives you the opportunity to learn eight of Buddy Holly’s tracks note for note and then jam along with a professional session band. the track listing reflects some of Holly’s most popular recordings, providing something for guitarists to have fun with and improvise with, as well as something to aspire to. This guitar workshop is a powerful learning tool that will help you develop your riffs, licks and improvisational skills. The CD is split into two sections; section 1 is the backing tracks minus lead guitar & vocals, while section 2 is the backing tracks with all guitar parts added, so in addition to the written tab you can hear the rhythm, fills and solos as they should be played! The ‘Jam With…’ series allows you to accurately recreate the original songs, or to use the transcriptions in this book in conjunction with the backing tracks as a basis for your own improvisation. Download Jam With Buddy Holly PDF free and other books from our site. Only high quality PDF scans. Please write a review, it's important for our community.